"Kraftwerk gave Coachella-goers an audio-visual spectacle at the California desert festival tonight (April 26) during their early evening set on the main stage. 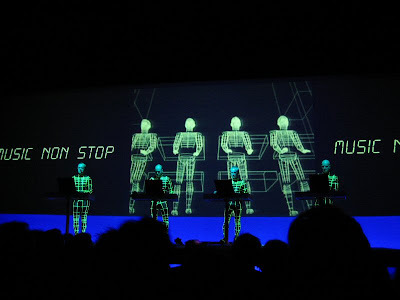 The German electro pioneers performed several classic tracks including 'Man Machine', 'Autobahn' and 'Trans Europe Express' underneath three massive screens that displayed video sequences tailor-made for each song. 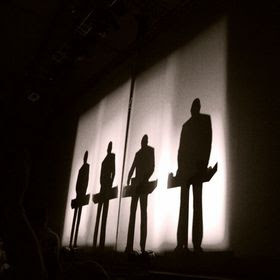 In typical Kraftwerk fashion, the four men stood behind their laptops programming beats without saying a word during their entire set. The band, who also played Coachella in 2004, drew a star-studded crowd including Aerosmith's Steven Tyler and actor David Hasselhoff, who watched from the VIP area." I saw Kraftwerk in The Brixton Academy a few years ago and had a great time. The only down point of the evening was trying to find a taxi home from Brixton at around 3 in the morning. Here's a very brief (less than 5 seconds) glimpse of Kraftwerk in 2008 (thanks to reslbear). They do appear to be wearing the same glowing grid outfits as they wore during the show I went to. Wonder how they wash those outfits, dry clean? MOT? The general format of the show seems about the same from the descriptions I've heard so far. Good to see them still touring and making a lot of people happy. So what do we think would happen if Daft Punk, Kayne West and Kraftwerk were performing on the same stage? Would we all be blinded? I'll leave to ponder that thought. Will post more photos and videos as they come in.